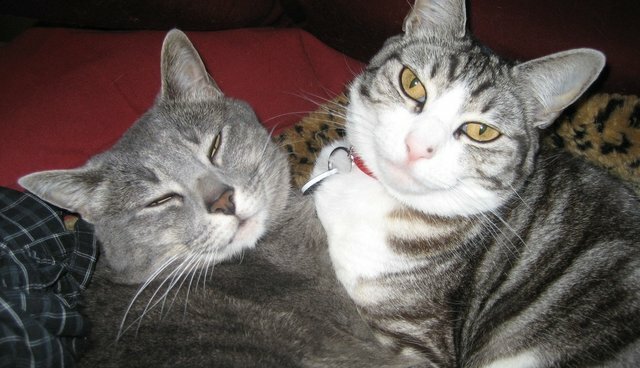 Confession: My cats are “just cats.” And that’s okay. My cats don't go rock-climbing. They don't have particularly funny markings. They don't rescue children, and they don't steal from the neighbors. They'll never throw a first pitch at a baseball game, or go to SXSW. And they definitely don't play guitar or ride on Roombas. What the heck DO my cats do? They snooze in the sun, chase feather wands, play with their catnip mice, climb their cat trees to watch birds, hang out with us on the couch and they love to eat treats. They purr, use their litter boxes and one of them snuggles under the covers with me at night. They can even do a few cute tricks, like sit and high five, but that's no ticket to feline fame anymore. It's a simple life, but I think we're all pretty happy with the arrangement. Why? Because my cats are both just your "average cat" and I'm okay with that. The new-found popularity of cats on the internet is great -- cats are getting more attention than ever before, and being a "cool" pet will hopefully lead more people to consider adopting a cat when they might not have otherwise. But this fame seems to come with a new pressure -- the pressure to be an "extraordinary" cat. Many years ago, I worked on the set of an audition for a TV game show for cats, assessing potential feline contestants for their TV-readiness. I had the tough job of deciding whether a cat was ready for a screen test, and telling the owners "no" when their cat had been rejected. My role was to ensure that any uncomfortable or stressed out cats were promptly sent on their way home. What was surprising to me was how determined some owners were that their cat get a chance at fame (oh, and a million dollars). It felt a bit "Toddlers & Tiaras" at times. These cats were primped and preened. Some of the cats were hissing, growling, hiding or even eliminating in their carriers. Those cats were a quick and easy "no." But their owners would often argue with me, begging for their cats to be given a screen test! The quest for money and fame was blinding them from the fact that their cat was in no way interested in this whole process (and was in fact quite stressed out)! So how do you know if your cat is cut out for fame? If your cat hides when the doorbell rings, or hates traveling in a carrier, or has serious aggressive episodes under pressure, she's probably not ready for her 15 minutes. The signs of stress in cats can vary, but hiding or shaking, tail swishing, a tight, tense body and hissing, growling or swatting are all signs that your cat is less than thrilled with his current situation. Regardless of your cat's confidence, in any new situation you should assess how safe and appropriate it is for cats. Some questions to ask: is my cat securely contained in their carrier or on a cat-friendly harness? What are the risks if my cat escaped (one of the biggest dangers to traveling cats is getting lost in an unfamiliar area)? Are there other uncontained animals (such as off-leash dogs) I should be worried about? I'm not saying that cats shouldn't ever be on TV or at events, or that people shouldn't train their cats or socialize them to new experiences (especially at a young age, when this training can have PROFOUNDLY positive aspects on their later lives). But I am saying that people should recognize that their cat may not be well-suited to being a celebrity, that a situation might not EVER be appropriate for cats (like being loose in a baseball stadium) and that your cat may prefer the quiet life back at home on the couch. So, if your cat doesn't do anything extraordinary -- that's okay -- because "just" being a cat is pretty cool already.